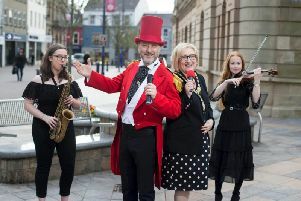 The Mayor of Derry City and Strabane District Council, Maoliosa McHugh pictured outside the Guildhall with some of the children who were part of the 16,000 local youngsters who came up with ideas to improve their homes in Derry and Strabane through art. He is pictured with schoolchildren Ronan and Darragh Craig, Cloughcor PS, Strabane and Aoibheann and Aodhan McNickle, St. Patrick's PS, Pennyburn. Included are Rachel Craig, Strategy Business Manager, DCSDC, Mr. John Kelpie, Chief Executive Officer, DCSDC and Gavin Killeen, Co-Chair, Strategic Growth Partnership. Just some of the many fantastic aspirations of children for Derry and Strabane have been captured in a special display which was unveiled by the Mayor. Thousands of primary school children took part in a campaign of engagement as part of the Community Planning process. They were asked to give their views on how they would like the future of Derry and Strabane to develop, with some visionary and creative results. Mayor of Derry and Strabane, Councillor Maolíosa McHugh, joined local school children for the official unveiling of the display, which is now on show in the Guildhall. And he praised the ambition and originality of the children who took part. “I am delighted to see some of the many wonderful ideas which were submitted as part of the Community Planning process being shared with the public,” he declared. “During my time as Mayor I have been impressed on so many occasions by the ambitions expressed by our young people and the pride they have in their home. The Strategic Growth Plan which emerged from the Community Planning process reflects the ambitions of thousands of local people, including our young people. The plan will shape development here until 2032, so it will have a major impact on the lives of the younger generation, who will hopefully enjoy the many benefits of the strategy in the long term. The Strategic Growth Plan for Derry and Strabane launched in November 2017, following a major campaign of public engagement taking in the opinions of thousands of local people. Schools were asked to submit their views on a range of themes designed to transform the Council area over the next 15 years to achieve a thriving, prosperous and sustainable City and District with equality of opportunity for all. A Children and Young Person’s version of the plan is now available to view online at growderrystrabane.com where you can find out more about Community Planning and how it affects your future.